Enter reclaimPrivacy.org , and a free tool to scan your profile settings and show what’s what. You can take the scanner and find out in moments just what personal info you’re making available. The program links you to pages that you can change and can be re-run time after time. This group has taken it upon themselves to write an application that will help you easily automate the complex process of learning what your privacy risks actually are, and then direct you to the fixes. If you don’t go to this site now and run it for yourself, you are missing out. If you choose to keep the privacy setting ‘loose’ then at least you’ll have a point of reference. With all the chat about Facebook privacy, and the LIke button popping up everywhere online, you should take the easy route this is it and see where you stand. I recommend you have a look and tighten up thinks a notch or two. 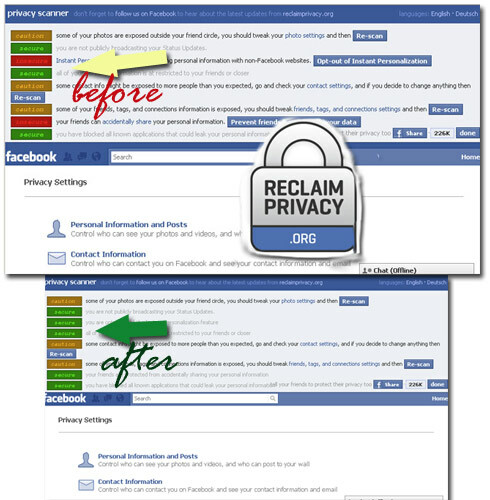 Visit the site at www.ReclaimPrivacy.org and follow the very easy steps to run the app. 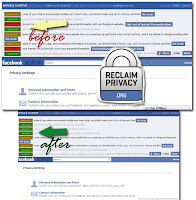 You will find that the Facebook changes that happen frequently will affect this tool and it’s abilitues and performance. Revisit this every 30-60 days and see what is different. Don’t forget to run this on your other family members’ profiles, especially the children. Share this with your friends, as they really need it, but know that you’re running the risk of social media support desk for life.